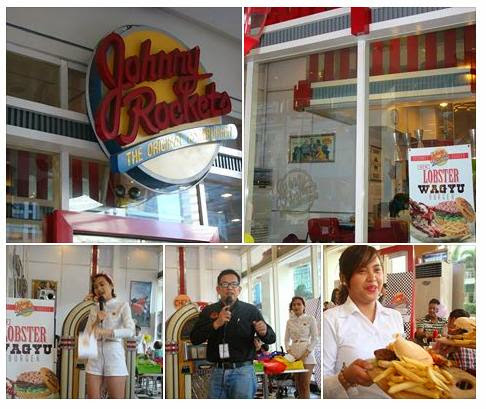 Last Friday, I was invited at Johnny Rockets to experience its latest addition to its Gourmet Burger Line. Lobster is the focal point of menu of Johnny Rockets’ Lobster Wagyu Burger. If you love Wagyu beef and lobster, this combo is basically a match made in heaven. Its P 925.00 price tag is an absolute steal. It uses prime Wagyu beef for its basic burger. Topped with lobster salad, the burger-and-bun format is unfussy. The gorgeous Wagyu meat was tender. The ingredients all play off each other perfectly! And it comes with a perfectly cooked, crispy potato fries which make for a simple yet delicious side plus half portion of the flavorful lobster grilled to perfection. The Lobster Wagyu Burger is anything but a burger. It was a great dining experience! The Lobster Wagyu Burger is a thankful addition to the restaurant’s exquisite gourmet offerings that includes the Truffle Burger and "Surf and Turf". Enjoy a great drink list that includes a selection of creamy milkshakes and malts to wash it all down. Physically, Johnny Rockets Eastwood is pretty nice. This phenomenal place takes good effort in making your dining experience memorable by providing a casual retro ambience. The talented bartenders and friendly servers strut their moves to entertain diners once the Jukebox rolls. The dance performances come in every 30 minutes. Johnny Rockets has been making its presence felt in the Philippine gourmet dining scenes since 2009 with its fun, dining atmosphere. If you are out looking for a great meal , do visit Johnny Rockets . While the food prices are slightly high, I think it was totally worth it. Next time you are at Eastwood and want more than a Burger, Lobster Wagyu Burger will not disappoint. Last week, I ate this Wagyu burger and really good in taste. that was a bomb! truly expensive. P950. OMG! It's nice to see new variants in their menu. I like the American style ambiance they have.